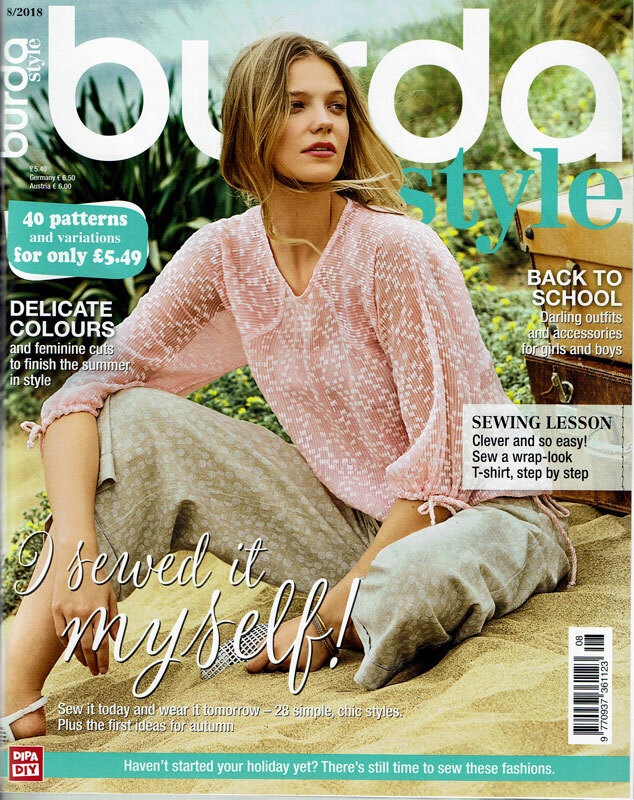 I can't believe it's the August issue already! Granted, I feel like I've lost five months of this year to being ill, but still, sitting here in London in a neverending heatwave, I'm not sure I'm ready to look at Fall fashions yet... and it looks like Burda feels the same, because while August issues are traditionally the start of the Fall fashions, this year it feels like a mishmash of Summer and pre-Fall. There's not much I personally actually want to make in this issue, but there's tons of great stuff nonetheless! I can’t believe it’s the August issue already! Granted, I feel like I’ve lost five months of this year to being ill, but still, sitting here in London in a neverending heatwave, I’m not sure I’m ready to look at Fall fashions yet… and it looks like Burda feels the same, because while August issues are traditionally the start of the Fall fashions, this year it feels like a mishmash of Summer and pre-Fall. There’s not much I personally actually want to make in this issue, but there’s tons of great stuff nonetheless! I love the look of wrap dresses, but London is a pretty windy city, and whenever I where them I constantly have to walk with my hand holding the flap down to not expose everyone, which is a real downer. This “wrap” shirtdress, however, only looks like a wrap dress, but everything’s fixed in place at the waist. So it’s safe to wear in windy conditions! I’m never a big fan of the ruched-hips look, but I love the rest of this jersey dress, sized for Petites. I especially love this type of collar, and there’s a sleeveless top version of this in this issue, too (but I thought that one looked quite cheap and messy in the fabric they used). Nothing crazy here, but a good casual pair of woven trousers is never a bad thing. Burda’s done that idiotic thing again, though, where instead of using wide elastic and topstitching lines through it, they create narrow channels and thread narrow elastic through. Urgh. Which means that the waistband will crumple and feel weird the second you sit down or bend over. Apart from their questionable finishing technique, this still looks like a nice pattern, especially for summer holidays, as suggested in the feature. Now I should be all over this tee – asymmetric draping and jersey? Oh yes! But that draped piece just looks really bad and uncomfortable over the model’s bust in every version shown in the magazine, like it’s just not lying properly. If you feel like fixing this, this pattern has the colour illustrated instructions in the magazine section this month. 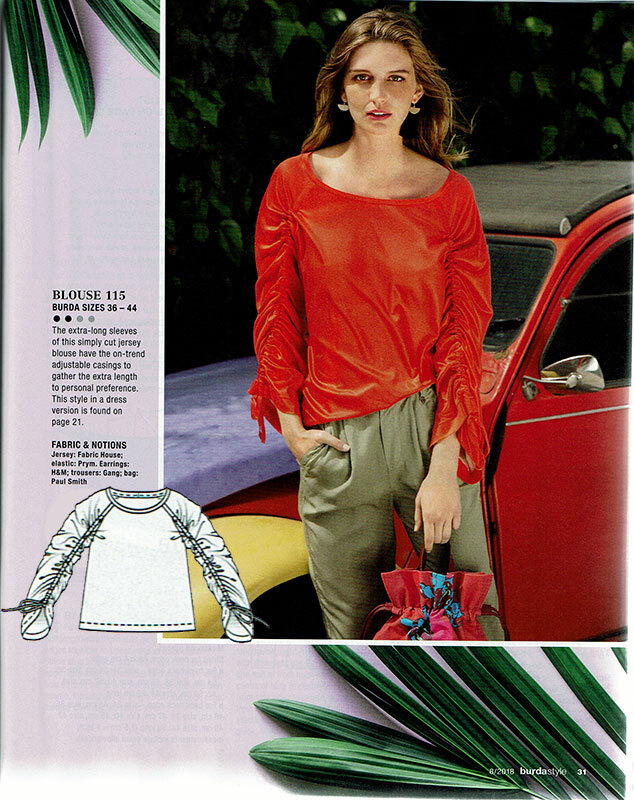 Burda are way more into this ruched-sleeve look than I am – they’ve made a shirt and dress version and given this the illustrated instructions, too. But when I turn the page and look at this, my first reaction is just “Ugh, no!” (and second reaction, and third reaction….). It just looks so messy and draws the eye totally to your arms, plus it’s even twisting around her arm. Ugh, no. I’m allergic to 70s “fashion” so I skipped right through the rest of this feature (except to chortle at the model apparently having a squatting poo in her casual trousers?!? ), but I like the idea of a bomber jacket with a tie collar. What a gorgeous sheath dress! The bodice seaming is so similar to the “Bamboo shoot” design in one of the Pattern Magic books, but Burda have saved you all the drafting time! 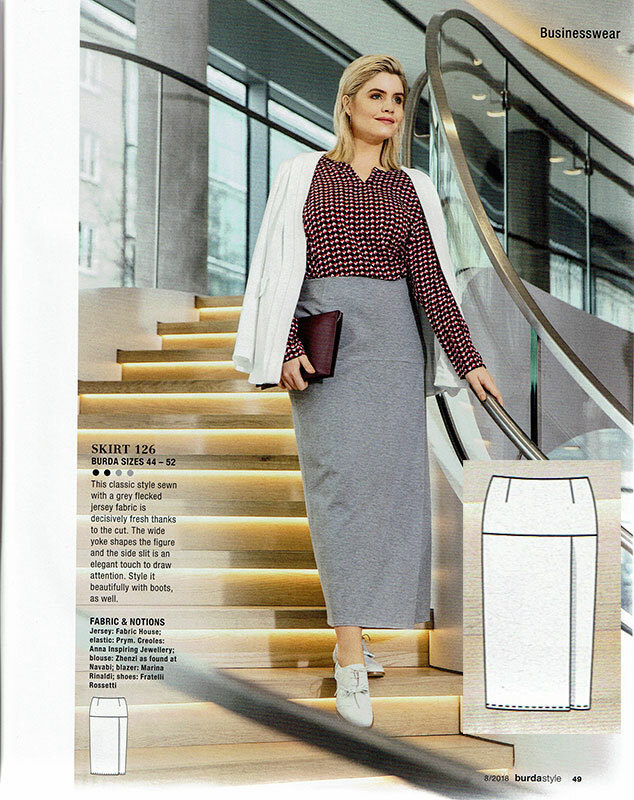 Yes – a jersey midi-length pencil skirt with flattering long yoke and pleated front. That pleat is enough to give walking ease, but as it’s not a full slit, you won’t expose yourself as the wind blows (see above!). 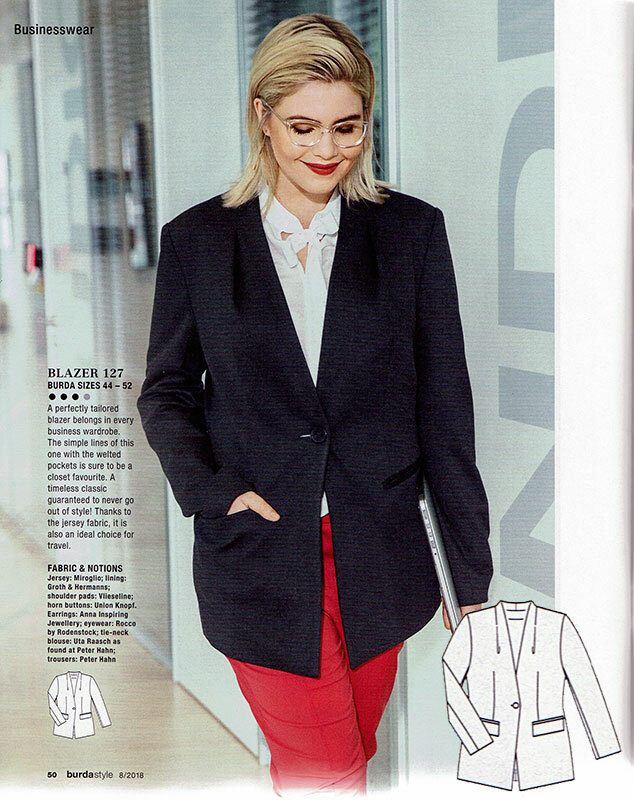 And my final pick for the Plus section is a really nice collarless, lined jersey blazer. Jersey blazer patterns aren’t that common anyway, and I feel like it’s even rarer to see them in Plus sizes. And Burda even threw in two illustrations for achieving the combined dart-and-welt-pocket area. 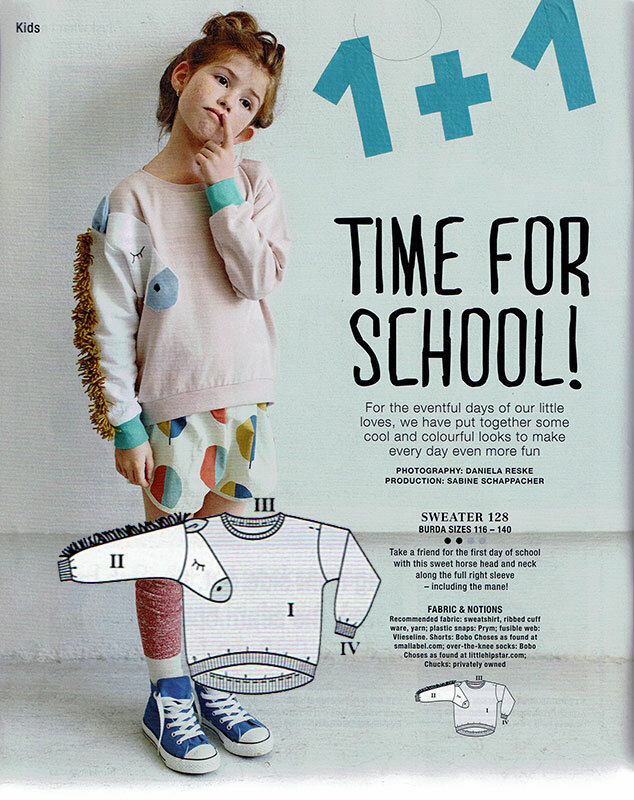 The kids section also has some truly inventive designs this month, like this sweatshirt where one sleeve and shoulder become a horse!! So cute. There’s also a puffa jacket where you separately piece all those coloured strips together them quilt them with batting (totally a labour of love! ), plus some decent-looking casual joggers (though I’m surprised they didn’t spruce them up with some of the novelty cuffs they were all over a few issues back). 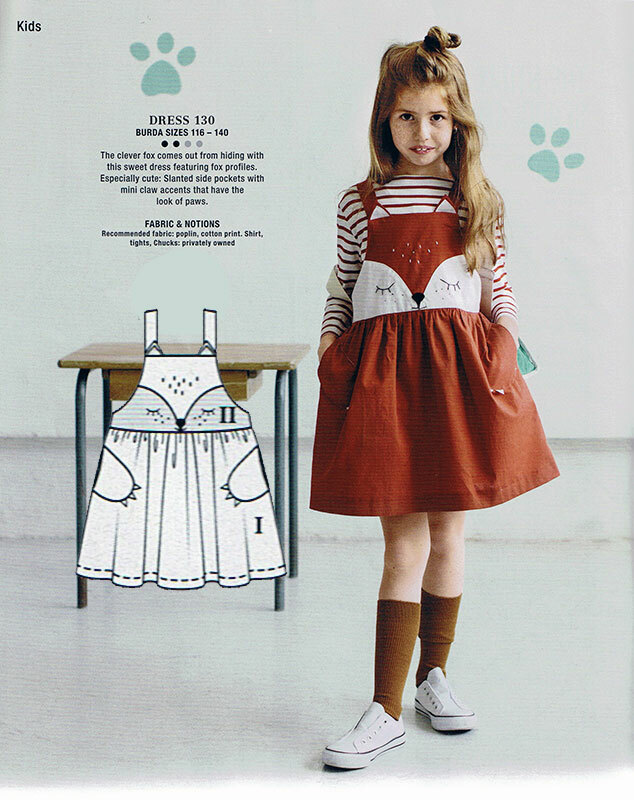 And finally, as you know my love of Burda’s fox designs, how could I resist this little fox pinafore dress?? I mean, the little pockets turn into fox paws! This is so adorable it almost makes me wish I had a kid to sew for! omg that H&M sweatshirt is too cute! You’re right, it would be easy to modify Burda’s to look more like that. Mixed feelings about this issue. The loose pants with the tied waist just remind me too much of the early 90s shapeless ones. I wore them then, but looking back, they were too much like pjs in an office setting. It’s hard to find shoes that look right with them too. I do like the tie-collar bomber jacket, but I think I might adapt the collar to a different style of jacket. 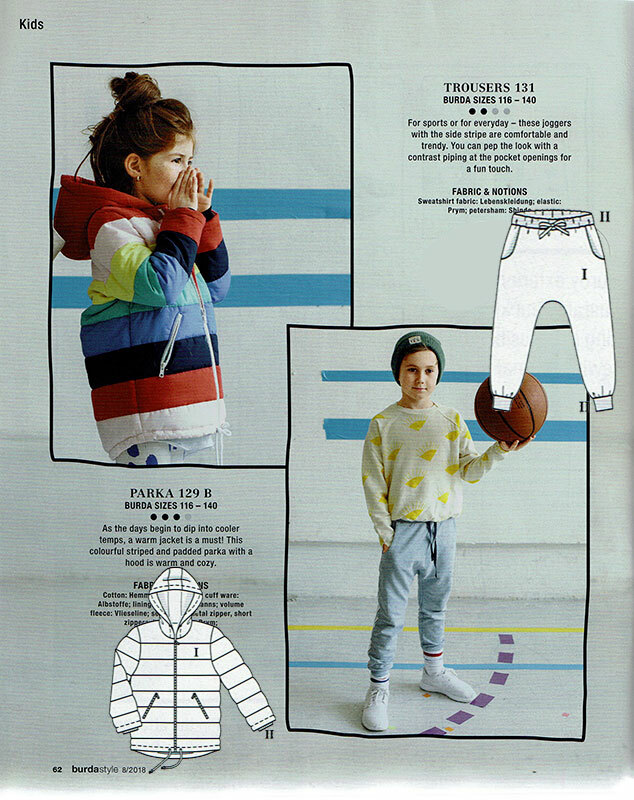 Burda has been doing some really cute kids patterns of late. Useless to me, but cute nonetheless! Yeah, I remember that too. The loose pants were my first foray into grown-up pants making and I made some out of a jade retro 40ish print that I loved. Almost identical to the pattern in the August issue. But, looking back, they were not the most flattering pants on me! There is a sweet and easy way to modify fake wrap tops with overlapping draped piece. I usually cut off one shoulder from the V-neck front piece, extending one leg of V to the armhole. Then I finish neckline on both top and bottom front pieces, join them stitching along seam allowances at the common armhole and common opposite side and continue working with front as a single piece. It’s way easier and more symmetrical than draping something over faced V-neck. You’re right that this issue does seem to be a bit of a mash up seasonally. There is still plenty that I like, but I’ll be focussing on the more summery stuff first. (well I say that, but there is a high chance fall really will have arrived by the time I get round to any of it! ).